We are working on new free messenger for free SMS for Android and iOS. There is a humorous version of the name - Snowden (in fact, it will be another. 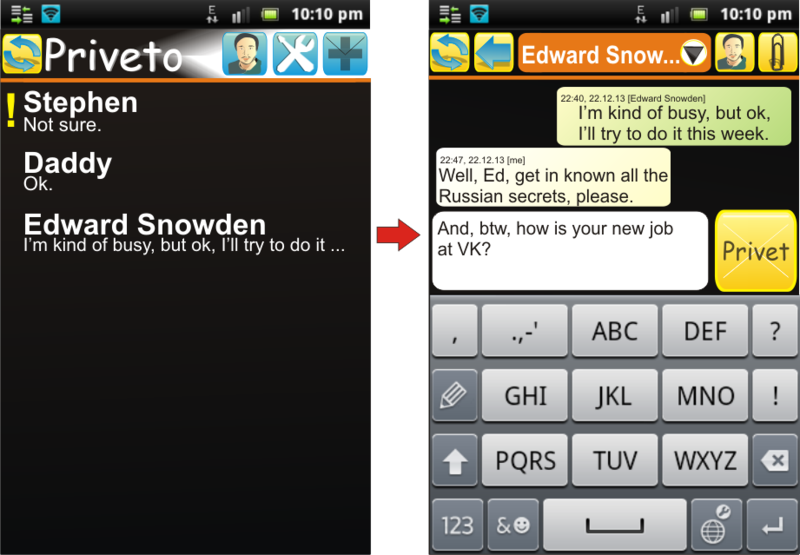 One of the candidates for the name is the Russian word "Privet" (= hello), at the same time that echoes the "private"). Perhaps you are now reading about the birth of a legend. Or maybe not. Why will you need our messenger? 1. Messenger is being developed simultaneously for two platforms: Android and iOS. 2. It is lighter (1 mb) weighs in ex of analogues, such as Whatsapp (of course, we do not compete with them, but we are studying the existing programs). In this case, Whatsapp, weighing 15 mb for Android, is not transferred to the memory card, taking the internal phone memory, which is often the cause of users criticism. 3. There are rumors that after the revelations of Snowden, Whatsapp and Viber will be banned in some countries. It is already banned in many countries, such as Saudi Arabia or China. 4. Now the main thing: why Whatsapp can be banned? Because they have their own server for messaging. Our program doesn't have any server, so your correspondence is better protected from unauthorized access. And our app can not be banned by any secret service. Also in view of the fact that our messenger has no server, your conversations will be safer and faster. Whatsapp users sometimes complain of a server crash or the disappearance of certain messages. 5. The number of characters in the correspondence is not limited, you can insert pictures or coordinates. And the messages are completely free of charge, if your calling plan includes Internet, or if you are surrounded by Wi-Fi. The program interface will coincide with the interface of a standard SMS-client. 6. It is also important: the only and maximum version will be free and will not contain advertising, as is customary with free programs. 7. And here's another huge advantage: your addressee doesn't need too have the same application, for your correspondence. He can read your messages in any browser, any computer, any OS. But in browser will be lost the element of speed, which is associated with SMS. 8. The user can write a message to his addressee from any browser, any OS. 9. On different phones, you can set the overall account. That is, the user is not tied to his phone number. 10. You do not need a SIM card for correspondence through our program. The program will be published approximately in winter for Android and iOS.